Two future Quinnipiac commits were selected Saturday in the Ontario Hockey League Priority Draft. 2001 born United States players in defenseman Dom Fensore (P.A.L Islanders) and forward Connor Tait (Team Maryland) both were selected by the Windsor Spitfires and Kitchener Rangers respectively. Fensore, a smaller quicker defenseman with a great transition game and offensive skill was selected by Windsor in the 8th round. The recruiting website has Fensore a 4.25 star recruit and was the 17th best US born player eligible for the OHL draft. Recently, Fensore took part in the USNTDP evaluation camp and the BobcatsHockeyBlog reported that he has made the Under 17 team even though the roster has yet to be formally announced. Fensore averaged over a point per game for the P.A.L. Islanders and was a power play threat as well. With Fensore making the US Developmental Program, it's unlikely he would head north of the border to play in the OHL ending his college eligibility especially with him being drafted in 8th round and already committed to a college. Tait, was selected in the 12th round by the Kitchener Rangers. A product of Team Maryland, Tait is a combination of size, speed, strength and skill. He is a 4 star according to the website Neutral Zone, and was the 20th best US prospect eligible for the OHL draft. Recently he was selected as the Washington Post Player of the Year after a 39 goal, 22 assist season for his high school team, Gonzaga Prep, which he helped lead to their first league title since 2014. Even with Tait's hockey season in the rear view mirror, he still working to get better with his skills via this Instagram video. 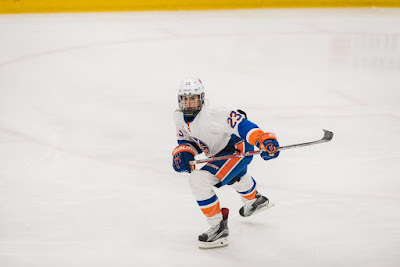 As with Fensore, Tait is not expected to head north across the border due to his college commitment and where he was selected in the draft but until he or Fensore step foot in Hamden its always possible players can go the major junior route.